Not to be confused with atomic mass (unit: Da or u). Example: copper in terrestrial sources. 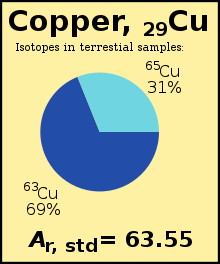 Two isotopes are present: copper-63 (62.9 u) and copper-65 (64.9 u), in abundances 69% + 31%. The standard atomic weight (Ar, standard) for copper is the average, taken their abundance into account, and then divided by the standardised ​1⁄12 12C unit. The standard atomic weight (Ar, standard, a relative atomic mass) is the atomic weight (Ar) of a chemical element, as appearing and met in the earthly environment. It reflects the variance of natural isotopes (and so weight differences) of an element. Values are defined by (restricted to) the IUPAC (CIAAW) definition of natural, stable, terrestrial sources. It is the most common and practical atomic weight used, for example to determine molar mass. The specified definition is to use many representative sources (samples) from the Earth, so that the value can widely be used as 'the' atomic weight for real life substances—for example, in pharmaceuticals and scientific research. Atomic weights are specific to single sources and samples of an element, such as the atomic weight of carbon in a particular bone from a particular archeological site. Standard atomic weight generalizes such values to the range of atomic weights which a chemist might expect to derive from many random samples from Earth. This range is the cause of the interval notation in some standard atomic weight values. Out of the 118 known chemical elements, 84 are stable and have this Earth-environment based value. Typically, such a value is, for example helium: Ar, standard(He) = 7000400260200000000♠4.002602(2). The "(2)" indicates the uncertainty in the last digit shown, to read 7000400260200000000♠4.002602 ±6994200000000000000♠0.000002. IUPAC also publishes abridged values, rounded to five significant figures. For helium, Ar, abridged(He) = 7000400260000000000♠4.0026. For twelve elements the samples diverge on this value, because their sample sources have had a different decay history. For example, thallium (Tl) in sedimentary rocks has a different isotopic composition than in igneous rocks and volcanic gases. For these elements, the standard atomic weight is noted as an interval: Ar, standard(Tl) = [204.38, 204.39]. With such an interval, for less demanding situations, IUPAC also publishes an conventional value. For thallium, Ar, conventional(Tl) = 7002204380000000000♠204.38. The standard atomic weight is thus a more special value of the relative atomic mass. It is defined as the "recommended values" of relative atomic masses of sources in the local environment of the Earth's crust and atmosphere as determined by the IUPAC Commission on Atomic Weights and Isotopic Abundances. (CIAAW) In general, values from different sources are subject to natural variation due to a different radioactive history of sources. Thus, standard atomic weights are an expectation range of atomic weights from a range of samples or sources. By limiting the sources to terrestrial origin only, the CIAAW-determined values have less variance, and are a more precise value for relative atomic masses (atomic weights) actually found and used in worldly materials. The CIAAW-published values are used and sometimes lawfully required in mass calculations. The values have an uncertainty (noted in brackets), or are an expectation interval (see example in illustration immediately above). This uncertainty reflects natural variability in isotopic distribution for an element, rather than uncertainty in measurement (which is much smaller with quality instruments). Although there is an attempt to cover the range of variability on Earth with standard atomic weight figures, there are known cases of mineral samples which contain elements with atomic weights that are outliers from the standard atomic weight range. For synthetic elements the isotope formed depends on the means of synthesis, so the concept of natural isotope abundance has no meaning. Therefore, for synthetic elements the total nucleon count[dubious – discuss] of the most stable isotope (i.e., the isotope with the longest half-life) is listed in brackets, in place of the standard atomic weight. When the term "atomic weight" is used in chemistry, usually it is the more specific standard atomic weight that is implied. It is standard atomic weights that are used in periodic tables and many standard references in ordinary terrestrial chemistry. Ar will be the dominant isotope. Such locations include the planets Mercury and Mars, and the moon Titan. On Earth the ratios of the three isotopes 36Ar : 38Ar : 40Ar are approximately 5 : 1 : 1600, giving terrestrial argon a standard atomic weight of 39.948(1). This atomic weight is larger than that of the next element potassium, causing confusion in the days when the places of elements in the periodic table was largely determined according to atomic weight. Ar (according to solar wind measurements), and the ratio of the three isotopes 36Ar : 38Ar : 40Ar in the atmospheres of the outer planets is 8400 : 1600 : 1. The atomic weight of argon in the Sun and most of the universe, therefore, would be only approximately 36.3. Measurement limits. As always, the physical measurement is never finite. There is always more detail to be found and read. This applies to every single, pure isotope found. For example, today the mass of the main natural fluorine isotope can be measured to the accuracy of eleven decimal places: 7001189984031630000♠18.998403163(6). But a still more precise measurement system could become available, producing more decimals. Earthly sources with a different history. A source is the greater area being researched, for example 'ocean water' or 'volcanic rock' (as opposed to a 'sample': the single heap of material being investigated). It appears that some elements have a different isotopic mix per source. For example, thallium in igneous rock has more lighter isotopes, while in sedimentary rock it has more heavy isotopes. There is no Earthly mean number. These elements show the interval notation: Ar, standard(Tl) = [7002204380000000000♠204.38, 7002204390000000000♠204.39]. For practical reasons, a simplified 'conventional' number is published too (for Tl: 204.38). These three uncertainties are accumulative. The published value is a result of all these. The estimation of the uncertainty is complicated, especially as the sample distribution is not necessarily symmetrical: the IUPAC standard relative atomic masses are quoted with estimated symmetrical uncertainties, and the value for silicon is 28.0855(3). The relative standard uncertainty in this value is 1×10–5 or 10 ppm. To further reflect this natural variability, in 2010, IUPAC made the decision to list the relative atomic masses of 10 elements as an interval rather than a fixed number. The use of the name "atomic weight" has attracted a great deal of controversy among scientists. Objectors to the name usually prefer the term "relative atomic mass" (not to be confused with atomic mass). The basic objection is that atomic weight is not a weight, that is the force exerted on an object in a gravitational field, measured in units of force such as the newton or poundal. molar concentration, which is not a molar quantity (a quantity expressed per unit amount of substance). It could be added that atomic weight is often not truly "atomic" either, as it does not correspond to the property of any individual atom. The same argument could be made against "relative atomic mass" used in this sense. IUPAC publishes one formal value for each stable element, called the standard atomic weight. Any updates are published biannually (in uneven years). The last change was published in 2015, setting a new value for ytterbium Per 2017, 14 atomic weights were changed, including argon changing from single number to interval value. The value published can have and uncertainty be an interval like for neon: 7001201797000000000♠20.1797(6), or can be an interval, like for boron: [10.806, 10.821]. Next to these 84 values, IUPAC also publishes abridged values (up to five digits per number only), and for the twelve interval values, conventional values (single number values). Symbol Ar is a relative atomic mass, for example from a specific sample. To be specific, the standard atomic weight can be noted as Ar, standard(E), where (E) is the element symbol. The abridged atomic weight, also published by CIAAW, is derived from the standard atomic weight reducing the numbers to five digits (five significant figures). The name does not say 'rounded'. Interval borders are rounded downwards for the first (lowmost) border, and upwards for the upward (upmost) border. This way, the more precise original interval is fully covered. Twelve chemical elements have a standard atomic weight that is defined not as a single number, but as an interval. For example, hydrogen has Ar, standard(H) = [1.00 784, 1.00811]. This notation states that the various sources on Earth have substantially different isotopic constitutions, and uncertainties are incorporated in the two numbers. For these elements, there is not an 'Earth average' constitution, and the 'right' value is not its middle (that would be 1.007975 for hydrogen, with an uncertainty of (±0.000135) that would make it just cover the interval). However, for situations where a less precise value is acceptable, CIAAW has published a single-number conventional atomic weight that can be used for example in trade. For hydrogen, Ar, conventional(H) = 1.008. The twelve elements are: hydrogen, lithium, boron, carbon, nitrogen, oxygen, magnesium, silicon, sulfur, chlorine, bromine and thallium. By using the abridged value, and the conventional value for the twelve interval values, a short IUPAC-defined value (5 digits plus uncertainty) can be given for all stable elements. In many situations, and in periodic tables, this may be sufficiently detailed. ^ a b c d Meija, Juris; et al. (2016). "Atomic weights of the elements 2013 (IUPAC Technical Report)". Pure and Applied Chemistry. 88 (3): 265–91. doi:10.1515/pac-2015-0305. ^ Wieser, M. E (2006). "Atomic weights of the elements 2005 (IUPAC Technical Report)" (PDF). Pure and Applied Chemistry. 78 (11): 2051–2066. doi:10.1351/pac200678112051. ^ IUPAC Goldbook says Definition of standard atomic weights: "Recommended values of relative atomic masses of the elements revised biennially by the IUPAC Commission on Atomic Weights and Isotopic Abundances and applicable to elements in any normal sample with a high level of confidence. A normal sample is any reasonably possible source of the element or its compounds in commerce for industry and science and has not been subject to significant modification of isotopic composition within a geologically brief period." ^ Lodders, K. (2008). "The solar argon abundance". Astrophysical Journal. 674 (1): 607–611. arXiv:0710.4523. Bibcode:2008ApJ...674..607L. doi:10.1086/524725. ^ National Institute of Standards and Technology. Atomic Weights and Isotopic Compositions for All Elements. ^ Meija, Juris; Mester, Zoltán (2008). "Uncertainty propagation of atomic weight measurement results". Metrologia. 45 (1): 53–62. Bibcode:2008Metro..45...53M. doi:10.1088/0026-1394/45/1/008. ^ a b de Bièvre, Paul; Peiser, H. Steffen (1992). "'Atomic Weight' — The Name, Its History, Definition, and Units" (PDF). Pure and Applied Chemistry. 64 (10): 1535–43. doi:10.1351/pac199264101535. ^ "Atomic Weights". Retrieved 2018-03-13. ^ a b IUPAC 2016, Table 1. ^ "Standard Atomic Weights 2015". Commission on Isotopic Abundances and Atomic Weights. 12 October 2015. Retrieved 18 February 2017. ^ "Standard atomic weights of 14 chemical elements revised". CIAAW. 2018-06-05. Retrieved 2019-02-02. ^ "Standard Atomic Weights of 14 Chemical Elements Revised". Chemistry International. 40 (4): 23–24. 2018. doi:10.1515/ci-2018-0409. ISSN 0193-6484. ^ a b IUPAC 2016, Table 2. ^ a b IUPAC 2016, Table 3. ^ IUPAC 2016, Table 2 and Table 3 combined. ^ a b "Standard Atomic Weight of Ytterbium Revised". Chemistry International. October 2015. p. 26. doi:10.1515/ci-2015-0512. eISSN 0193-6484. ISSN 0193-6484.